Yamaha announced new components and V1.5 firmware update that will further enhance the versatility and performance of the RIVAGE PM10 Digital Mixing System. The announcement was made at Pro Light + Sound 2017. The new CS-R10-S control surface is approximately two-thirds the size of the existing CS-R10, and offers the same operability for applications where space is limited. A Dual Console function (to be supported in a future update) will allow two CS-R10 and/or CS-R10-S control surfaces to be connected to a single DSP-R10 DSP engine so that separate CS-R10-S control surfaces can be used at both front of house and monitor mix positions. A CS-R10-S will also be able to be used as a sidecar for a CS-R10. The HY256-TL-SMF is a TWINLANe card that supports single-mode optical fiber. 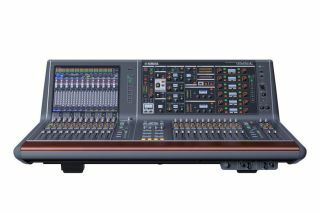 The Yamaha TWINLANe audio network with up to a 400-channel capacity had previously only supported multi-mode fiber connections. The new HY256-TL-SMF expands system connection flexibility by additionally supporting single-mode fiber connections. Yamaha RIVAGE PM10 firmware update V1.5 includes an Eventide “H3000 Live” Ultra-Harmonizer plug-in and Dan Dugan Sound Design automatic mixer plug-in. The original Eventide H3000 Ultra-Harmonizer offers effect quality making it an enduring favorite among engineers and musicians, and the newly developed H3000 Live plug-in offers that same performance optimized for live-sound applications. The Dugan plug-in also suppresses feedback and comb filter effects, freeing the engineer from the need to keep track of numerous faders in challenging unscripted speech situations, numerous Speech System channels, and five groups so processing can be divided into as many as five independent automixers. A new analog delay and other Yamaha plug-ins have been added in PM10 V1.5 expanding the variety of sound-shaping tools for mix engineers.